The comments came at a CNN town hall in Washington, D.C., on Wednesday night, where Inslee pitched his message of combating climate change, but also fielded questions from voters, including college students, on subjects including gun violence, marijuana and college affordability. 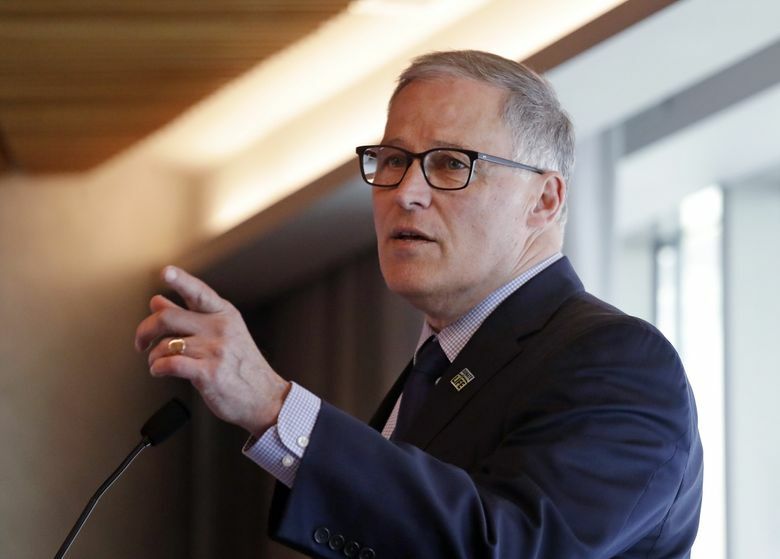 Inslee faced a pair of uncomfortable lines of questioning on Boeing, his home state’s aerospace giant. One student asked whether Inslee as president would have moved to more swiftly ground the 737 MAX airliners, before two crashes that killed 346 people. Calling the disasters a “painful thing” for the people who make the airplanes, Inslee suggested he would have. Another student asked about corporate tax breaks, leading Inslee to pronounce himself “very disturbed” by the trend of companies dangling jobs for such subsidies and said the federal tax code could perhaps be altered to discourage such acts. That led moderator Wolf Blitzer to press Inslee on the record-setting $8.7 billion tax-break package Inslee supported for Boeing in 2013. Noting the years of job reductions by the company that followed, Blitzer asked whether Inslee had made a bad deal. Since the Boeing deal, the company’s overall employment in the state has declined. Boeing last year added almost 4,000 jobs in Washington — its first increase in six years. Despite that gain, Boeing employs 17,200 fewer people in the state than it did at its peak in the fall of 2012, according to figures released by the company in January. Two Republican state lawmakers criticized Inslee’s latest Boeing statements, which followed similar comments he made during an appearance on Comedy Central’s The Daily Show last month. “Throughout his tenure as governor, Mr. Inslee has failed the people of Washington state time and time again. And now, as he makes a bid for the presidency, he is failing them again by publicly disparaging the state’s largest employer with claims of ‘mugging,’ ‘blackmail,’ and ‘extortion,’ ” said Rep. Norma Smith, R-Clinton, and Rep. Drew MacEwen, R-Union, in a statement Thursday. The hourlong town hall produced no new details of Inslee’s national plan for climate change. The governor, walking the stage in a blue suit, greenish tie and Washington apple lapel pin, repeated his unique commitment among 2020 candidates to making climate change the No. 1 national priority. He got in an early dig at President Donald Trump’s recent comment that noise from windmills causes cancer. “When we get a president of the United States that understands wind turbines don’t cause cancer, they cause jobs … we will know what to do,” Inslee said. On many issues at the town hall, a common theme emerged for Inslee. He said to look to policies adopted by Washington state under his years as governor, from lowering tuition, to initiatives that enacted new gun restrictions, and his own pardons of some minor marijuana offenses. “What I would suggest is the things we have done in our state again could be a model in the United States,” he said. While Inslee mostly defended his record over his years as governor, and before that in Congress, Blitzer elicited one regret. He asked Inslee about his vote for a 1994 crime bill that led to increased incarceration that has disproportionately affected people of color. “If I knew then what I knew now I would not have cast that vote,” Inslee said. On Trump and Republicans, Inslee had no kind words. He declined to name a single policy on which he agrees with Republicans, other than holding elections every four years. Asked whether he considered himself part of the anti-Trump “resistance,” Inslee said he’s “not just part of it … I like to see myself as a leader of it,” boasting that Washington has repeatedly sued the administration. CNN has been hosting town halls for each of the Democratic candidates for president; Inslee’s turn was sandwiched between New York Sen. Kirsten Gillibrand on Tuesday and former Housing and Urban Development Secretary Julian Castro, scheduled for Thursday. Inslee departed Washington state on Tuesday and will remain on a campaign swing for the next several days, with stops in New York, New Hampshire, Iowa and South Carolina. He is scheduled to return to the state April 16. This story has been updated with context on Boeing’s tax-break deal and the company’s employment figures in Washington state.